An astonishing audiobook that probes into the strange world of genetic engineering. Joanna May thought herself unique, indivisible - until one day, to her hideous shock, she discovered herself to be five: though childless she was a mother; though an only child she was surrounded by sisters young enough to be her daughers - Jane, Julie, Gina and Alice, the clones of Joanna May. How will they withstand the shock of first meeting? And what of the avenging Carl, Joanna's former husband and the clones' creator: will he take revenge for his wife's infidelity and destroy her sisters one by one? In this astonishing novel, Fay Weldon weaves a web of paradox quite awesome in its cunning. 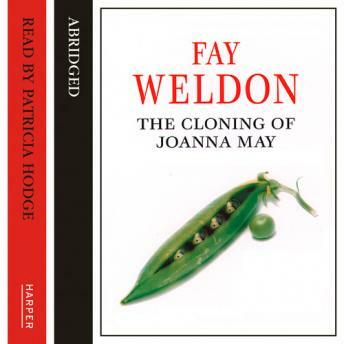 Probing into the strange world of genetic engineering, The Cloning of Joanna May raises frightening questions about our identity as individuals - and provides some startling answers. Funny, serious, revolutionary, this is the work of a master storyteller at the height of her powers.